“Are we just one personality type?” is a common question in Enneagram workshops. The answer is both “yes and no!” The Enneagram is a dynamic system, meaning that we are not limited to just one point on the diagram; we often move around to other Enneagram points depending on our needs and circumstances. While we keep our basic personality type as “home base,” we also spend time visiting and inhabiting other personality types. However, this is not a random process. The Enneagram diagram itself indicates the patterns or pathways that each personality type tends to follow. Since the symbol itself is quite striking, when people first encounter the Enneagram they often wonder if the lines in the diagram mean anything. They are indeed important; the lines trace the routes along which we travel when we go through shifts of awareness and behavior in our daily lives. We move along these lines from one point to another. Sometimes we go back and forth very quickly, hardly noticing the change in our outlook. At other times we may experience a more dramatic shift, or spend quite a bit of time in a point other than our basic personality type. It seems that there is some inherent, organizing intelligence in the diagram itself. In this way the Enneagram is different from other personality systems. There are other useful systems which describe three, four, or sixteen types. But the Enneagram is more than a simple list; it’s a holistic system based on the symmetry and mathematics of this ancient diagram. Apparently the lines indicate the ways that energy moves in repeated patterns. When it comes to people, the lines seem to carry important information about our psychological patterns. This part of the Enneagram teaching is somewhat mysterious. How could the lines of this diagram predict the behavior of people in daily life? We have every reason to be skeptical. Certainly there is no scientific proof! How do we know this isn’t some form of New Age hocus-pocus? The only real answer is by testing the theory, by seeing for yourself if it has any practical value. You may be able to observe in your own life the patterns of behavior described by the lines of the diagram. Now that the Enneagram has been used by hundreds of thousands of people over several decades, there does seem to be a consensus that the lines do mean something, even if there is sometimes disagreement over exactly what that is. The next section discusses some of the concepts underlying the “Lines of the Enneagram” theory. It’s not strictly necessary for understanding personality type. If you like, you can skip it and go directly to the section on “Wing Points and Dynamic Points” and how this applies to your personality type. There is a body of Enneagram teaching which has traditionally used this diagram as a way of understanding the “natural laws of the universe,” e.g. how all events or phenomena move in patterns. This study was based on both the properties of numbers and the use of intuition; as far as we know, it began long before the scientific discoveries of recent centuries. In the modern era, patterns of energy can be studied and quantified in more precise ways, although some topics, things like quantum physics, still challenge the limits of our current analyses. There may well be large meta-patterns that we don’t yet fully understand. In earlier times in human history, scholars and thinkers tried to explain the natural world through the use of numbers and diagrams such as the Enneagram. While we don’t highlight this use of the Enneagram in our discussion of personality types, there are some interesting numerical aspects which can help us in our study of human beings. If you look at the nine-pointed diagram, you will see that there are two overlapping sets of lines. One is the triangle joining points 3, 6, and 9. According to tradition, this “inner triangle” illustrates the “Law of Three” which shows up in both religious and secular contexts. In Christian terms this corresponds to the Holy Trinity, the three major aspects of Divinity - Father, Son, and Holy Ghost. (There is also a Hindu Trinity). In secular terms, the Law of Three might be described as thesis, antithesis, and synthesis. George Gurdjieff, who brought the Enneagram to the West in 1915, introduced the concept in this way: Point Three is the place of initiating energy (Holy Affirming); Point Six is the place of resisting and developing energy (Holy Denying); Point Nine is the place of mediating and harmonizing energy (Holy Reconciling). What’s fascinating about this is that the personality types whom we associate with these points seem to embody something of these qualities. Threes have that wonderful initiating, go-forward spirit. Sixes often say “Hold on a minute: let’s develop this idea further, let’s find what’s wrong with it and come up with a better plan.” And Nines are people who seek balance and harmony; they are innate mediators. (In a more humorous vein we sometimes describe personality types 3, 6, and 9 has exhibiting the qualities of Holy Yes, Holy No, and Holy Maybe). The lines of this inner triangle connect these three personality types. In the next section we will look at how they move back and forth from one point to another under different conditions. In any event, there is something very useful about this idea of“three-ness.” In order to start a new project or activity we need to have enough motivation and “initiating” energy. But as we all know, things don’t simply move forward in a straight line. This certainly shows up in our work on personal growth. There is always resistance or some kind of obstacle in the way, either something in ourselves or something in our environment which needs to be overcome (often both). If we are able to engage this set of obstacles in an intelligent way, to see it as a useful part of the process, our original plan or intention evolves into something even more successful. Another way to say this: if we are able to have a good conversation, or a productive conflict, between the initiating parts and the resisting parts we move to some kind of resolution or synthesis. But without this process, projects or people don’t develop and grow into something greater. 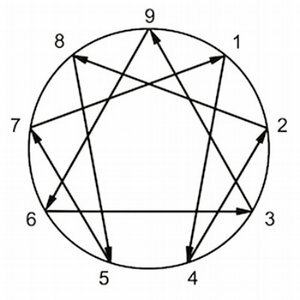 The second set of lines inside the Enneagram is the one that connects points 1, 4, 2, 8, 5, and 7. This is used to illustrate the “Law of Seven,” a number set which is associated with the seven notes of our musical scale. While the Law of Three has to do with qualities of energy, or three different kinds of force at work, the Law of Seven has to do with the movement of energy - the progression of steps or the chain of events in every activity or project. Some people have found the Law of Seven very useful in planning their work, making sure to include the necessary steps and the interventions that are key components of keeping things moving toward a successful conclusion. However, this is outside the scope of our current discussion. For now we can simply notice how this set of lines, and the relationships between the numbers on this set of lines, inform our study of personality type. If we divide 1 (or unity) by the number 7, we get a repeating decimal: .142857142.... So the lines inside the Enneagram follow this progression of numbers. According to Enneagram theory, the personality types here (Types 1, 4, 2, 8, 5, and 7) move back and forth along these lines under different internal conditions. We’ll start with wing points, the two points next to our own “home base” on the circumference of the circle. It’s as though these points are our close neighbors and we can visit them easily since they’re right next door. So it doesn’t take much to move over and adopt the point of view and the personal style of our wing points. While they are different types from our own, they are not so different that we can’t easily see the world through their eyes or take on their habits, both good and bad. When people are first discovering their personality type they often identify with one or both of their wings. In fact some people may see themselves almost equally in two neighboring types. They’re not sure which one is their primary type. Perhaps one reason for this is that every personality type can be described as a combination of the two wing points. For example, if we blended a Nine and a Two we’d come up with something that looked like at One. And if we blended a Four and a Six we’d come up with a Five. We have access to both of our wings. Each has a different set of resources and characteristics that we will find helpful at times. However, there is some evidence that one of these wings is more familiar, or predominant. Some Enneagram authors have gone so far as to describe 18 variations of personality type organized by the predominant wing. You can observe yourself to discover whether you have such a predominant wing or whether you experience yourself moving to both wings on an equal basis. Whichever pattern holds true, it is clear that our basic personality type is heavily influenced by the presence of these wings, leading to important fluctuations in our behavior and perspective as well as interesting variations among the nine types. In contrast to moving to our wing points, the movement inside the Enneagram is not an easy visit next door but rather a significant shift in our experience of ourselves. We call them dynamic, or psychodynamic, because our personality goes through a major, if temporary, change. We are in a very different point of view and style of behavior. We notice it, and often the people around us notice it. Sometimes these shifts are upsetting and confusing, as though they were happening outside of our control. But when we are aware of these shifts and can manage them properly, they can be very fruitful for our personal and professional development. It’s as though we have access to a whole new set of resources, and it’s a set that adds value or creates needed balance to our usual personality. Moving to these dynamic points can help us step out of the box, expand our options, and become less stuck in our habitual style of responding to the world around us. Whether we are on the inner triangle (connecting points 3, 6, and 9) or on the other set of lines (connecting points 1, 4, 2, 8, 5, and 7) there are two lines connecting our personality type to two other points. However, each line has a different “direction” and a different quality to it. In one direction (we generally say the “forward” direction) lies our “resource point.” This is a point where we can access some important quality that helps us take action in the world. Many Enneagram teachers call this the “stress point” because either 1) we go there when we are under significant stress; or 2) we go there to access the intelligence and competencies of that point, yet we find it stressful to be there. Both statements are true, but since “stress point” has a negative connotation we are using the term “resource point.” It’s not necessarily a bad thing! But it can be very uncomfortable. In the other direction (we generally say “moving back”) lies our “relaxation point” or "heart point." When we travel in this direction, we move to inhabit a personality type that is considered to be very valuable for our personal growth and transformation. This point seems to hold a key to many of the underlying issues of our personality as the “shadow side” or the undeveloped side of ourselves. It’s as though we have to relax and let down our usual defenses, letting go of our normal way of seeing the world in order to open up and become more flexible and more vulnerable. When we feel safe and secure we are able to go deeper within ourselves, learning more about who we really are and becoming more available to intimates and loved ones. Of course getting in touch with core issues and feelings in our relaxation point can be very challenging. There’s a tendency to snap back to our personality type with its familiar point of view and standard operating procedures. However, if we can stay long enough in our relaxation point to integrate the lessons there, we can re-inhabit our personality type with much more balance and integration. According to the Enneagram, we move “forward” to our resource point in this way: 3 goes to 9, 9 to 6, and 6 to 3 (3963). Or on the other set of lines: 1 goes to 4, 4 to 2, 2 to 8, 8 to 5, 5 to 7, 7 to 1. (1428571). Moving to our relaxation point we move “backwards” in the opposite direction: 3 goes to 6, 6 to 9, 9 to 3. (3693) On the other set of lines: 1 goes to 7, 7 to 5, 5 to 8, 8 to 2, 2 to 4, 4 to 1. (1758241) This will become clearer as we go through the nine personality types and talk about each one in turn. When their Nine wing is predominant, Ones will be more oriented toward harmony and balance. The drive to get things just right is mediated by a desire to be comfortable. They may become calmer, adopting a slower pace. A possible drawback to this wing is that it can make Ones even more set in their ways, less adaptable or flexible to the expectations of others or the needs of the moment. An advantage to this wing is the ability to be productive in a steady, methodical way while keeping attention on quality and correctness. When their Two wing is predominant, Ones are drawn toward relationships with others. Doing the right things now includes being supportive and helpful. With this wing is active, Ones are more expressive and forward moving. A possible drawback here is the anxiety or upset that arises from interpersonal conflicts or the sense that other people aren’t “doing it right.” An advantage to this wing is that it makes possible a very effective combination of people skills and organizational skills. The task of creating order and right results is focused more on people than on material objects. The relaxation point for Ones is Point Seven. Rather than seeking to find the one right way, Ones can now open up to many possibilities. It’s easier to tolerate multiple options and plans. They are less critical and judgmental of themselves and others. When Ones relax into Seven, they often shed physical tension, so it’s easier to have fun and go with the flow. If this relaxation point is not well integrated however, it’s possible that Ones can “act out” now that their usual self control is gone. They might drink to excess and over consume. Yet when they succeed in integrating these two points, they can have the enthusiasm and positive spirit of Seven infusing the responsibility and hard work of the One. Flexibility and spontaneity are joined with integrity and purposefulness. With their One wing predominating, the natural expressiveness of the Twos is balanced by a need to “get it right.” On the plus side they are more organized and controlled in they way they exert their considerable relational skills. They tend to be more thoughtful, balancing their emotionality with self discipline and a more careful analysis of situations. On the negative side this combination of opposing characteristics can lead to inner conflict and physical tension. Twos get uncomfortably “jammed up” if they become too self critical, if everything has to be perfect. When managed well, the self-containment of the One wing and the natural warmth and outgoing energy of the Two creates a very stable and effective style. When the Three wing predominates, Twos use their phenomenal ability to tune in and meet the needs and expectations of other people to become successful in their job or profession. They are flexible and responsive to a high degree. Up to a point, they can match the Threes step for step in working hard for results. But they aren’t true Threes and over time they will need to slow down to avoid burn-out. With the Three wing active, Twos make excellent communicators and performers. However, this wing point will also make it more difficult for Twos to bring their attention inside to their own needs, feelings, and personal agendas. Twos move to Point Four as their relaxation point. In contrast to their usual style of paying attention to other people as a way to create success and security, here their attention is drawn more to the inside. They are able to feel their own feelings, make contact with their inner needs. The drawback is that like the Fours themselves, Twos may become stuck in a state of sadness or melancholy which is sustained by seeing only what is missing in work or in relationship. However, the ability to center inside oneself, to know what one really wants or longs for, to develop the capacity for emotional depth, all help balance and empower the Two’s capacity for external connection and teamwork. Being at Four can help a Two find a home inside themselves. In the other direction, Point Eight is the resource point for the Twos. Whether or not this is a productive position depends on how the Twos manage the assertive, often angry energy of Point Eight. Do they go there in a grounded way or do they “fly off the handle?” Some Twos naturally seem to combine the expansive “going forward” energy of their type with the expansive “asserting and taking charge” energy of the Eight. Others have difficulty moving to Eight unless there is a lot of external pressure or stress. Some access to Point Eight is valuable for learning to handle conflict, which does not generally come easily for Twos. Being able to make boundaries and say “no” is a skill more readily available at Point Eight. When their Two wing is predominant, Threes tend to be quite warm and engaging. They can bring their attention to making personal connections in the service of the work. Successful relationships with others are part of their overall program for achievement and productivity. These Threes will exhibit more of the people skills that we normally associate with Point Two. They can be very gregarious people, sustaining contact way beyond what most personality types can tolerate. The problem area here is how both points reinforce a dependency on external approval and recognition, which may lead to superficiality. However, with the influence of their Two wing, Threes can be very skilled in leading and managing large numbers of people. With the Four wing predominant, Threes have more access to their own internal states and moods. They are more likely to develop a personal agenda, at least in their off hours. And they will at times retreat from constant busyness to regroup or to analyze their options. However, if personal feelings are set aside too much in the attempt to maintain a successful image, Threes can suffer from depression. The Four wing may also influence Threes to place more attention to intellectual content in contrast to the people orientation of the Two wing. The relaxation point for Threes is Point Six. When Threes feel secure enough to take a break from constant action and performing, they open up space for thinking about their lives, their relationships, and where they want to go. For all Threes, but especially those in positions of leadership, the ability to pose questions, comprehend opposing forces, and develop strategy that comes with the Six territory is crucial for long term success and effectiveness. Rather than simply taking on agendas and goals without thinking, some time spent at Point Six encourages discernment and informed decision making. Of course being at Six may bring up unfamiliar experiences of fear and doubt. It helps to know that these disturbing feelings or insecurities are a necessary part of personal and professional development. The resource point for Threes is Point Nine. There are times when Threes definitely need to become more inclusive. In contrast to their usual driven, competitive style, moving to Point Nine develops the ability to see other points of view, to bring people together on task in a different, perhaps less directive, way. There is also the possibility at Point Nine of slowing down a bit and following more body-based rhythmic patterns of activity and rest. Sometimes Threes will be forced into Nine by overwork and stress. They can become spaced out or inert, which is very uncharacteristic for them. If Threes can move to Nine without too much stress, they will benefit from the grounding and harmonizing qualities that are available there. When the Three wing is predominant, Fours turn their attention to the external world. They can work side by side with the Threes and achieve similar success in business. They will put aside much of their individualism to blend in while keeping some personalized touches in their style or presentation. They are well able to “feel out” and meet the expectations of others, but there will always be some tension between their public or social image and their inner life. They will be impatient with activities that seem mundane or superficial and will want to pursue things that offer greater depth. This can lead to an attitude of complaint or it can propel them to seek excellence in whatever they do. When the Five wing is predominant, Fours are much more likely to seek jobs and lifestyles which offer lots of privacy and time to turn their attention inward. Many Four artists, writers, musicians and scholars fit this profile. In the workplace, Fours with this wing will need less personal contact, although there is still a feeling of being in relationship with others, even at a distance. Compared to those with a Three wing, these Fours will be less attentive to the subtleties of interpersonal relationships or the expectations of colleagues. Other people may see them as aloof, arrogant, or eccentric. However, what they lack in people skills they may make up for with personal creativity. The relaxation point for Fours is Point One. When Fours feel secure and well appreciated, their center of gravity tends to shift to the belly center. They become more physically grounded and emotionally calm. They have fewer wide swings of emotion, less moodiness. The feeling of longing and melancholy transforms into One style criticality backed up by a sense of practical action. They want to put things right more than dwell in what is missing. Instead of tending to feel victimized, they are better able to stand up for themselves in a consistent way. Instead of volatile, angry outbursts, they are steadier with their instinctual energy and self assertion. It’s possible that Fours here can become too critical of other people, but as Ones know, it’s possible to seek improvement and orderliness while making the effort to stay friendly. The resource point for Fours is Point Two. Many Fours report that it can be stressful to stay too long in this “nicer,” more forward-moving point. Or it can begin to feel false, as though they are giving up their individuality in order to win approval and make personal connections. However, if not overdone, being at Point Two can help bring Fours out of their interior world where they can get stuck in being self absorbed and isolated. The difference between a good or unhappy experience with this movement seems to rest on the element of choice. If Fours can choose, or at least accept, that they are leaving their comfort zone to put themselves in the external environment of relationship, that will work much better than feeling forced to meet and greet people. When the Four wing is predominant, Fives tend to have a more active emotional life. Even though feelings may be closely held and hard to identify, they are definitely present and will influence decisions and behavior. A challenge here is to integrate the thinking and feeling functions so that they aren’t pulling one in different directions, or generating conflict. While the Four wing may support greater interpersonal warmth, it can also lead to a more erratic or disjointed style. With this wing there is more emphasis placed on figuring out relationships instead of dwelling entirely in scientific or materialistic paradigms. Since empathy is so important in relationship, most Fives will be pulled toward this wing at times when seeking personal connection and when functioning as partners or parents. When the Six wing is predominant, the activity of the mental center is reinforced. Here there is a strong focus on technical data, systems of information, and knowledge as a solution to life’s challenges. The problem side of this wing is that Fives may find themselves prone to increased fear and worry. Threats and dangers seem magnified. They may feel it necessary to put up even more boundaries or seek refuge in intellectual detachment. On the plus side this wing reinforces the tremendous perceptive abilities of the Five and the potential for creative, even brilliant, insight. Like the Sixes, they can be very loyal either to a relationship or to a system of ideas. Point Eight is the relaxation point for Fives. This shift may be quite dramatic. All of sudden, a quiet and somewhat withdrawn Five becomes more body-based, more assertive, and even excessive in the way they express themselves. For the friend or partner it can be quite a challenge. For one thing, both the Five and Eight points are self-referencing. It’s not easy to hear or include another person’s feelings or point of view. But there is lots of good energy here if it’s well managed. How wonderful for a somewhat detached, mental type to access the instinctual vitality and (potential) grounded-ness of the Eight. There are some Fives who traverse this line regularly in their physical activities, such as sports, martial arts, or a committed outdoor lifestyle. The resource point for Five is Point Seven. Instead of their usual reserve, moving to Seven gives the Five a more outgoing and gregarious style. Often we see Fives who can become the life of the party, talking up a storm when their enthusiasm is engaged. The reverse is also true - when Fives feel pressured to relate and talk to people they may experience being at Seven as very stressful, and on the inside they are counting the minutes until they can make their escape and retreat to their own private space. When the Five wing is predominant, Sixes will be interested in preserving privacy and confidentiality as central to their sense of security. They may seem reserved or uncomfortable in social situations, unless they know people quite well. Knowledge will be valued more than experience, and the Six tendency to figure everything out before taking action is highlighted. Cognitive skills are emphasized here. Procrastination can be an issue, as in putting off decisions or doing things that require visibility. They often like structured learning situations, as in school, and may continue on as teachers, professors, writers, scholars, or scientists. While they might become isolated at times or feel lots of ambivalence towards other people, their security depends on relationships with family or friends and keeping a system of agreements in place. By contrast, the Seven wing impels Sixes towards participating in enjoyable experiences and adventures. Like the Sevens, they thrive on creating interesting plans and options, but they also need to know what the limits are. The skeptical or doubting mind is still present, but they are more likely to want to engage other people in spirited discussion of ideas and issues. They can appear both outgoing and edgy, inclusive and yet critical. They want to work things out with people even if that means agreeing to disagree. Group trips, group sports, and group projects are preferred. Point Nine is the relaxation point for Sixes. This shift can be noticed when Sixes drop their center of gravity down to the belly. They become less concerned with figuring things out and more accepting of whatever happens. Their habit of scanning for danger, anticipating problems, questionning people’s motives falls away. They literally relax into their bodies and into the more diffuse consciousness of Point Nine. It’s possible that Sixes can overdo it, or end up with some of the Nine-type problems like inertia or indiscrimination. But there’s great potential in the combination of perceptive intellect and instinctual grounded-ness. Many Sixes develop their bodies through exercise or athletics, which is great as far as it goes. It’s possible to direct the body without relaxing the mind, missing out on the “big picture thinking” and “going with the flow” style of Nine. Point Three is the resource point for Sixes. Moving to Three offers Sixes the possibility of getting quickly into action and achieving results in a more immediate way. It can be a great relief for Sixes to “just do it” and leave behind the (sometimes) excessive thinking and doubting of their personality type. This is a bit different from what we call “counter-phobic” behavior. Instead of being guided (or controlled) by intellect or rules and the mustering of courage, the Three energy is more responsive and adaptable. It’s more about meeting external expectations. In business, Sixes are often pulled, or pushed, into the Three position. They can do this up to a point but they will eventually find it quite stressful. In order to avoid burnout or getting sick, they will need to get back to their home base at Point Six. With a Six wing predominating, Sevens are reinforced as mental types, for better and worse. On the one hand they can get stuck in their heads, hardly ever visiting their bodies or feelings. On the other they have the capacity for systems thinking, planning and visioning, and tremendous mental speed and agility. Sevens with this wing also tend to pick up some of the loyalty of the Sixes. Operating with a six-like code of behavior, they can be more committed in their relationships and exhibit some staying power in team projects and relationships. With an Eight wing predominating, Sevens are pulled toward more sensate, or physical, experiences. They can be great adventurers, whether that means extreme sports, business ventures, travel, partying, or all of the above. The expansiveness of both points can take them far into the world. You won’t find them sitting a home much, or being stuck in an office for too long. Whatever they think or imagine, they believe they can do. Of course that’s not always true, and these Sevens have to watch out for getting overextended in whatever they do and losing their grounding. They can also be self referencing to an extreme, following their own desires or vision of what life should be. While this quality makes them highly creative, it can also lead to self absorption. It helps if they are willing to be accountable to something or someone outside themselves. The relaxation point for Seven is Point Five. Interestingly, when Sevens feel safe and secure, when they are able to remediate their normal attentional style of “up and out.” They go inside themselves and get quiet and reflective. This is by no means easy, and Sevens will usually encounter both fear and frustration along the way. It may also seem boring and lonely. But most Sevens understand that there is a huge advantage in being able to center inside oneself, to quiet the mind in order to think clearly and perceptively, and to withdraw at least temporarily from the rapid flow of activity and stimulation. Ironically, when they do so, other people may be concerned or alarmed. “What’s wrong?” they might ask. “Why are you so quiet or withdrawn?” They will be back shortly, hopefully with a stronger sense of being centered inside themselves and a greater ability to set limits and make wise choices. The resource point for Seven is Point One. Since Sevens are usually dedicated to a position of “I’m OK, you’re OK, ” the movement to One is involves being critical. Things should be done “right,” or even perfectly. When Sevens are pushed here by stress they will exhibit the lower aspects of One, as in being resentful and judgmental. Instead of “we’re all OK” now it’s “you’re doing it wrong.” However, the opportunity here is that Sevens can pick up some of the structure and responsibility of Point One. They get more organized, more orderly, and step out of endless options and start to focus on practical action. When their Seven wing is predominant, Eights can be very charming, charismatic, and outgoing. Much like the Seven with the Eight wing, their closest neighbor, they will embrace adventure and experience. (They will be a bit more physically grounded than the Sevens, and usually not as mentally agile). They have a tremendous access to vitality, enthusiasm, and forcefulness. When this energy is well channeled, they can be business entrepreneurs, builders and contractors, athletes and warriors, or successful professionals in any field. Both Sevens and Eights are what we call "self referencing," so a problem with this type is their tendency to be out for themselves and lacking consideration for others. They need to hear directly about the impact of their behavior from others. By contrast, the Nine wing makes Eights a bit more “laid back.” They exercise their strength or control more from behind the scenes. Their energy is often quieter that the other Eights, which may give people the idea that they are not particularly aggressive, only to be surprised when they do get riled up. These Eights will also be more "obsessive," which means that like the Nines they will tend to get stuck in repeating patterns and habits. They may have Nine-like trouble with inertia and momentum. It's hard to get things started, and then hard to stop or change directions. Getting angry is a favorite way for these Eights to wrest themselves out of immobility and get their energy moving. The relaxation point for Eight is Two. Here they can gain direct access to their emotional center. While many Eights have a generous and caring side, it’s not easy for them to be vulnerable or receptive. To the degree that an Eight has marshaled their defenses and assertiveness to face a world filled with conflict, it takes quite a lot of courage to open up and be seen as having tender or vulnerable feelings. But there is a big payoff here. Spending time in their heart point makes them more accessible for caring contact, and better at extending empathy (which Twos are so good at). It also provides a different and yet important kind of information and intelligence for making better decisions. People's emotions, even if well hidden, supply energy and create motivation for better and worse in daily life. Eights move to Point Five as their resource point. This is a very familiar movement to many Eights who seek out privacy on a daily basis. They too need their own space. Instead of their usual mode of charging into activity, being in Five allows for quieter reflection and strategizing. Eights tend to be over invested in everything, so some amount of detachment and distance can be helpful. However, if Eights stay too long in Five, or they are driven into Five by overwhelming conflict or upset, it’s possible for them to become very shut down, leading to deep depression. The One wing can bring a Nine well into the territory of One, so much so that it can be difficult to distinguish the Nine personality from that of the One. Here Nines can be very exacting, very methodical, very principled, and at times perfectionistic. However, they won’t be driven to get everything right and they will knock off work long before Ones feel the need to . Harmony is still the main goal; it just seems to lie along the path of getting everything in its right place and being a good person who follows the rules. Although they may be rebellious on the inside, Nines with a One wing feel compelled to comply with the wishes and expectations of authority figures. They just don’t keep up their compliance as thoroughly or as long as the Ones, and they will “forget” or “act out” in some kind of passive aggressive way at times. The Eight wing brings Nines well over to the angry rebellious side of themselves. In the southern United States there is an archetypal role we know as “Bubba.” These men (usually men although there is a rowdy female counterpart) are like the “good old boys.” They’re generally peaceful, but if they live in a culture which promotes or tolerates aggressive behavior they will certainly blend with that. With an Eight wing, Nines can demonstrate much more assertiveness than their “good” cousins with a One wing. The question is whether this comes out in well managed ways, in leadership ability and a willingness to fight for truth and justice, or whether it comes in the form of angry eruptions. The relaxation point for Nine is Three. Here Nines move into a much more active feeling center. While this can be overwhelming at times, leading Nines to question: “Who am I?” or “What is my true identity?” it can also support a quicker, more involved style of relating to others. Using a tennis metaphor, instead of hitting the ball over to the Nine side of the court and waiting while they hang out with it, think it over, or commune with the surrounding environment - when Nines are in Three, the ball comes right back. There is less delay and more back and forth in relationship. The resource point for Nine is Six. When Nines are pressured or motivated by external events, when they need to step out of their comfort zone in the face of problems or conflicts that they can’t avoid, they will often move to Six. Here perception is sharpened. Instead of seeing all points of view or screening out information that is disturbing to them, Nines are now able to focus on trouble spots. They are better able to discern between alternatives and chart a course of action. The obvious drawback is that Nines may become much more anxious or fearful at Point Six and lack the familiarity or resources to handle it well.